And now cue howls of outrage that Trump is stacking the Fed board with even more... doves? At the very least, Moore has established himself as one of Powell's most outspoken critics. And while the head of the central bank has repeatedly insisted that Trump doesn't have the authority to fire him - and that he would not obey an order from the president to step aside before the end of his term, Moore argued in an essay published late last year that Powell should do the right thing and resign, having lost all credibility. "It's time to find a new pilot at the Fed," Moore concluded. It looks like Trump agrees. President Trump has just enlisted a key ally in his battle of wills with Fed Chairman Jerome Powell. 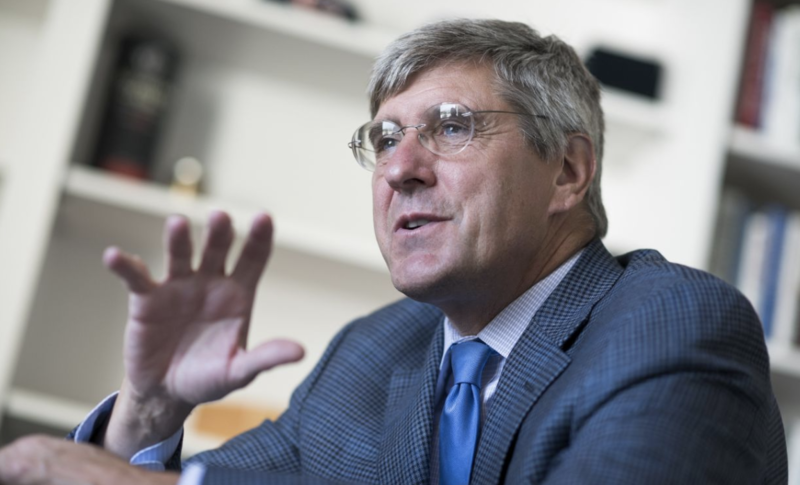 Though Powell and the Fed have already capitulated to Trump's demands to end QT, the president has reportedly tapped his former campaign advisor and former Wall Street Journal editorial board member Stephen Moore to fill one of the two remaining vacancies on the Federal Reserve Board of Governors. Bloomberg reported Thursday night that Moore was being considered for the seat, and on Friday morning, WSJ Fed correspondent Nick Timiraos reported Friday morning that Trump had informally offered Moore the job. Though Moore told Timiraos that he hadn't yet received a formal offer, he said he would absolutely accept it. According to Timiraos, the administration is now beginning to process of vetting Moore, and the FBI will presumably run a background check. The timing is not inauspicious: Trump praised Moore for a WSJ editorial published last week, where he and another author attacked the Powell Fed as a "threat to growth". Once a prominent critic of the Fed's loose-money policies, Moore has shifted his view to better accommodate the president, arguing that the Fed shouldn't support excessively loose or excessively tight monetary policy, and that it should seek to stabilize monetary conditions by pursuing "stable commodity prices" (i.e. "inflation"). Assuming Moore clears his vetting and the Senate, the Trump Administration will still need to fill a second seat on the Fed's Reserve Board. Other rumored candidates have included Herman Cain (yes, that Herman Cain) - though WSJ reported that the administration isn't anywhere close to settling on a candidate.